I think with the whole Iron Man buzz in the air at the moment, the time is right to publish this, something I began writing when the first rumours of an Iron Man movie were surfacing more than 2 years ago now. Someone asked me who my favourite comic-book character was, it wasn't a quick answer but I had to say that it was Iron Man. Most people expect Batman or even Spider-Man, many would presume someone more 'military' like a G.I.Joe character or The Punisher or those who know who he is; Nick Fury. No, while I've read and enjoyed many of their adventures, Iron Man is my firm-favourite comic book character. Anthony 'Tony' Stark inherited his fathers arms company after his parents were killed in a motor-vehicle accident. The young Stark founded a cosy little Empire and by the time of the Vietnam War he was supplying the US Military with then state-of-the-art weaponry. He kept a very hands-on approach to his business and even traveled to Vietnam in '68 to advise the military on the use of his weapons systems. Unfortunately during this visit there was a Viet-Cong attack and an unfortunate explosion left a piece of shrapnel dangerously close to his heart. He was captured by the VC and was instructed to create weapons for them instead. 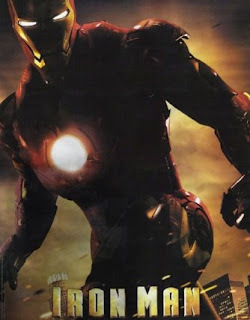 Stark designed, built and constructed a metal torso which sent light electrical pulses to his heart to keep it beating. It was cumbersome and he had to wear it for a few hours each day and it had to be recharged after use which took a while. 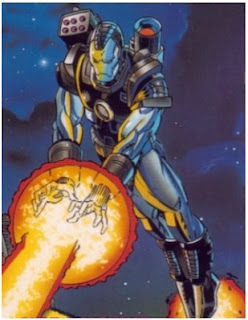 He then had the idea to create an entire suit of armour with the capability to fly and have built in weapon systems. Thankfully the VC generously allowed him to build this under their noses and so he did, and promptly escaped from his captors with one of the most powerful weapons in the world- the Iron Man armour. Stark founded a multi-million dollar engineering and electronics company Stark International. Stark himself was naturally CEO and he cast Iron Man in the role of his personal bodyguard which was a good cover story as Iron Man obviously made frequent appearances in the vicinity of Stark, especially when he or someone was in trouble. Stark lost his company after falling foul of alcohol, it was bought out by Obidiah Stane a rival manufacturer. Once Stark began the road to recovery he uprooted all he had left and and moved everything lock stock and barrel to the West Coast and settled in California's Silicon Valley. There he founded Stark Enterprises and soon the company had grown 10 times what his previous company was, making Stark one of the richest men in the world. Stark had very few close relationships with anyone, but one man who stood by him throughout most of his adventures was James "Rhody" Rhodes a US Air Force pilot whom was shot down and interred at the same POW camp where Stark created Iron Man. Stark helped him escape and he has been his personal pilot and general right-hand man ever since. Rhody knows Stark is Iron Man and has worn the armour himself many times especially during a two year period when Stark was addicted to alcohol and in no condition to operate the armour. During times where Stark and Iron Man needed to be in two places at once (or indeed the same place both as Stark and Iron Man), then Rhody was Iron Man. Rhody now wears the War-Machine armour; an ultra-powerful combat suit with more firepower than a US Marine Expeditionary Unit. No hero would be complete without nemeses; Some of his more difficult foes have included, The Living Laser, Doctor Doom, Titanium Man, The Crimson Dynamo and Fing Fang Foom. Through various circumstances he's also gone up against The Incredible Hulk and S.H.I.E.L.D. Out of all the villains Iron Man has faced over the years however, none have been more dangerous to him than The Mandarin. Of Asian descent this madman held power over 10 magical rings, each with a unique ability that spell doom for Iron Man. As with most comic-books over the years there has been some retconning, which was used to alter historical facts fit the approximate age of the character in present day. 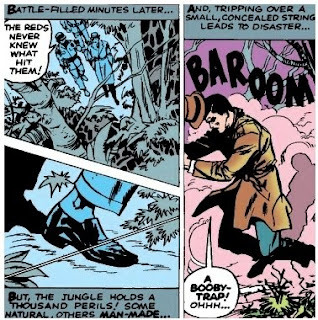 As Tony Stark is perpetually in his mid 30's, he obviously couldn't have been captured during the Vietnam War 40 years ago. Thankfully the US was engaged in another war when Iron Man rebooted a few years ago and it was alluded to that Stark was injured in Afghanistan and captured by Al-Qaeda, facts that Director Jon Favreau has adopted for the movie. Later, I will recount for you my earliest memories of Iron Man and a brief history of the Comic Book itself and what I've learned from reading it.